Bunnies Just Want to Have Fun! You should have seen him when he took off running with it! Had a delay here today while storms rolled through causing the power to flicker. That is always the signal to power down and take a break. Sunshine is back and here I am to share some bunny fun! Previously, I posted about ways to protect your space and your bunny with bunnyproofing. Now its time for fun! A bored bunny is a destructive bunny. Helping a bunny have fun will aid your bunnyproofing. Find things they enjoy doing and they will leave other things alone. What each bunny likes is different. There are jumpers, chewers, diggers, throwers, and a few do like to play chase. Do some trial and error to find out what your bunny likes best. You can find toys at pet stores, baby stores, or online sites. Don’t limit yourself to just rabbit toys. Look for untreated wood chews or wood toys. There are cardboard chews, cardboard tunnels and rabbit “bungalows or cottages” available. Hard plastic toys are great: Here are some ideas and the sections we found them in: keys on a ring (infant/baby), linked chains (bird), balls with bells inside (cat / ferret), bounce back treat dispensers (small animal), rattles (infant/baby), and Slinkies (kid) are all possibilities. 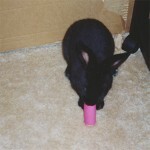 If you have a problem area where your rabbit likes to misbehave, try “mining” the area with belled toys. 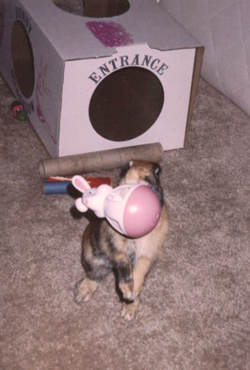 When you hear the bells, you know it is time to check and see if your bunny has taken advantage of the toys or needs to be escorted out of the forbidden zone. If you have a safe space for it, you can try a sandbox for a digger bunny. If not, try filling a box with shredded paper and watch your bunny go burrowing through. We remembered the fun of childhood sheet forts and created a sheet tunnel. We took two cardboard boxes with cutouts at each end and on one side, placed them five feet apart, and stretched a sheet over. The bunnies love to run through, burrow in and out under the sheet, and sometimes just nap. We play peek-a-bunny by lifting the sheet up and down at the side peering in on them. Tigger flings this like a shot putter does. She will grab it with her teeth and whirl around to get it airborne and throw it. Some bunnies like to play chase. Our Shadow will start to run and look back to see if we’re following. He will run back and start again until someone chases him. His happy binkies tell us we have the right idea. Be careful to know your bunny well with this one, since most bunnies fear being chased. 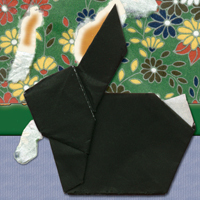 Our rabbits love to hop up with us while we read magazines and try to chew them. We take the pull out ad cards and hold them sticking out a bit at the edge of the magazine. They grab the edge of the card, yank it away from us, and run off with it. Shadow and Tigger like the game so much that if we want to continue reading, we usually have to gather the cards back up and keep letting them “steal” them away. We take cardboard tubes from paper towels and load them into a small lightweight plastic wastebasket which we set upright in the play area. Tigger and Shadow love to overturn the basket and unload the tubes. We also put a boatload of cardboard tubes under one bookshelf Tigger liked to commando crawl under. It would take her awhile to pull enough tubes out to try to get under. That would give us an opportunity to stop the secret carpet chewing that would occur if we didn’t catch her in time. The more time you spend with your rabbit learning about their play style, the more you will learn about just how playful and fun a rabbit can be. Just be careful to stay back a bit until you learn whether your bunny is a thrower like our Tigger. Tigger likes to pitch and bat. 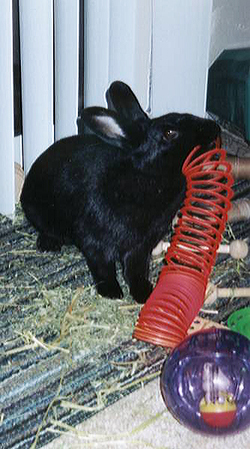 She will pitch her weighted bounce back bunny as in the picture, or small wire or plastic belled toys. She will take cardboard tubes from paper towel rolls and use them like a bat to hit things. I had one vet visit where I brought one along to keep her distracted while we were waiting, not realizing how she would use it. She was smacking everything she could with it so loudly that even with a closed-door, the vet techs kept coming in every few minutes to make sure everything was okay. Silly me thinking I could get her to be playful and forget where she was.